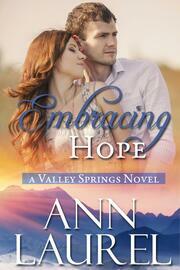 Introducing Ann Laurel’s first Christian contemporary romance series – Valley Springs. Meet 5 couples from Valley Springs and take the journey through life’s struggles and hardships into the fullness of a life of love and happy endings. Book One - Embracing Hope. Single mother Riley struggles with raising her baby, Zeke, by herself. Too many wrong choices lead her down a path of destruction. Young Pastor Micah set in motion help for single mothers and extends his hand to Riley. Will she accept his help before it is too late? Valley Springs Novel Series - Embracing Hope, Embracing Life, Embracing Purpose, Embracing Love, and Embracing Courage - can be read as stand-alones or within the series. All novels hold strong Christian tones.